The owners of this home in a coastal Los Angeles neighborhood came to Tom Stout of Stout Design Build during the midst of a home remodel. While upgrading the interior, they also chose to redesign their outdoor spaces to serve as an extension of their home. “As a family, they wanted to enjoy the indoor/outdoor lifestyle for which Southern California is well-known,” says Stout. Collaborating with interior designer, Linda Spiegel, he was able to create a calming retreat for this family that seamlessly integrates with the Cape Cod style of the home. For these homeowners, the relationship between indoors and out was crucial. Because interior work was occurring simultaneously, Stout was able to integrate the landscape with the home in ways that aren’t always possible. Glass collapsible doors open the living room up directly onto the patio seating area, while the ashlar pattern bluestone extends three feet into the home to begin the transition,” he explains. 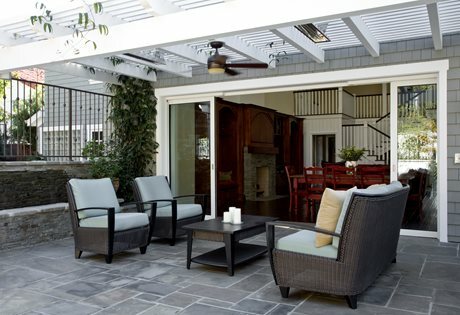 A wooden patio cover painted white serves as a ceiling to this outdoor room, providing shade during the summer and warmth from attached heaters during the winter. A retaining wall which supports the upper pool area runs along one side of the seating area. “We turned this wall into a weeping water feature to provide tranquil sounds for the patio,” says Stout. Above the seating area, the pool and surrounding decking were updated with a new pebble sheen interior finish, glass waterline tile and bluestone coping. An outdoor fireplace was added at the far end of the seating area. “We placed the fireplace to serve as a focal point from inside the living room that would draw people out into the yard,” Stout explains. The gas fueled fireplace was clad in the same ledger stone used on the indoor fireplace, further enhancing the connection between the interior and exterior. 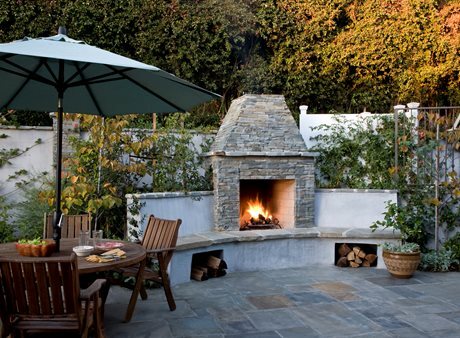 The fireplace also helps support the hillside and acts as a screen for the pool equipment. 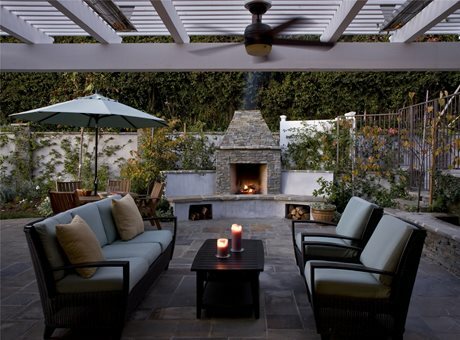 Often, the homeowners can be found gathering around the fireplace with friends and family to ease the chill from the cool coastal breezes that are common in Pacific Palisades. Conveniently located near the back door, but just out of view from the living room is an L-shaped outdoor kitchen with bar seating. This setup is ideal for outdoor entertaining because the cook can be at the grill, but still socialize with guests. “The bar stools are adjacent to the seating area so that people can interact between these spaces,” says Stout. The outdoor kitchen features a stainless steel grill, refrigerator, sink and wet bar. Ledger stone veneer and bluestone counters tie it in with the rest of the landscape. Just past the kitchen is a lawn space where the homeowners’ three young children can play. New block retaining walls were necessary to extend this area, adding an extra six feet along the back of the property. Stout softened the 7 foot high wall with bermed planter beds at its base. The planting plan for this project focused on flowering plants with white blooms and gray foliage tying it all together. 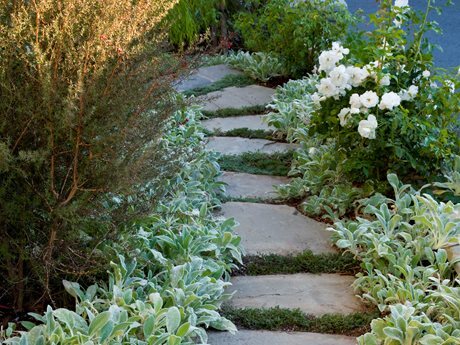 “Plants with a silvery-gray hue blend well with bluestone,” states Stout. Climbing vines were also included to soften the retaining walls and to create a lush covering over the pergola. Stout Design Build specializes in low-water plantings, but the Cape Cod style of this home called for a different approach. “While these plants require more water, we still did our best to be as sustainable as possible,” he notes. Stout also helped transform the property’s front yard, which had a significant elevation change that needed to be addressed. “Situated on a corner, the lot is 12 feet lower at the colored concrete driveway on the South side of the property,” he says. 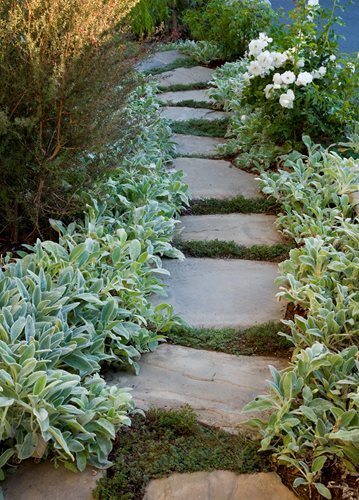 A series of steps, pathways and walls gradually traverse the slope, leading up to the home’s entrance. “Our clients didn’t want a large bank of stairs, so we creatively graded the space and split up the steps with inclined bluestone pathways in between,” Stout explains. Because they chose to do home renovations at the same time as landscaping work, these homeowners got the strong sense of indoor/outdoor connection they desired for their property. Stout Design Build succeeded at providing creative outdoor spaces for the family that are functional as well as beautiful and can be used all year long.